A completely biased review of some of the highlights of Infinite's career so far. Korean pop, or as the many fans call it, K-pop, is an up and coming phenomena all around the world. It originated in South Korea (hence the “k” for Korean) and quickly became known globally through its catchy pop music, colorful videos and the pretty and talented “idols” in each guy and girl group. People that want to be K-pop idols train with companies from their early teen years in order to be placed into a group that might not even be successful. The groups usually tend to be larger than a typical American band. One group called Super Junior even had fifteen members at its height. Perhaps one of the most popular and talented boy groups in k-pop at the moment is Infinite. This group consists of seven members: Kim Sunggyu, Nam Woohyun, Lee Howon (aka Hoya), Jang Dongwoo, Kim Myungsoo (aka L), Lee Sungyeol, and the youngest, Lee Sungjong. These seven boys are known for their old school beats and their sharp, in sync, dancing skills. Come Back again was Infinite’s debut song. The song, the dance, and even the costumes that the boys wore seem to be inspired by Michael Jackson’s style of pop music. It starts off with the members’ heads down as a strong guitar is played. Then, they continue the theme by doing the King of Pop’s famous lean to the side. The dance break continues for some time, but then the lyrics slide in almost effortlessly. The members don’t miss a beat when the leader of the group, Sunggyu, starts to sing with his famous power vocals. Although his voice is a little more raspy than usual in this song, his vocals set the precedent for the rest of his musical career so far. The next dance break is heavily concentrated on the guitar in the song. The members do a dance move that resembles strumming the guitar. After the simple chorus of “dashi dorowa,” a short rap begins. Short and frequent rap parts is another characteristic of K-pop. Most K-pop songs have rap parts in them, and the groups often have at least one member almost fully dedicated to rap. In the case of Infinite, they have two rappers who happen to be the main dancers as well. About a minute and forty seconds into the song, the rapping and singing start to blend into an almost call and response way. As this is going on, the boys do more smooth dance moves. Then they all turn around except for two, who, during another instrumental break, kick up the dancing a notch with strong and precise dance moves. The best part of this song is the tiny little “hee hee”’s in the background. They really bring the Michael Jackson concept to life. At the end of the video, the song and dance is all tied together with one last guitar strum accompanied by the guitar strumming dance move. As a debut song, Come Back Again truly killed it. The beat and concept is unlike anything any K-pop artist has ever released before. Infinite became an instant hit because of their new sound. K-pop fans welcomed the change from classic K-pop music to a new and more vintage feel. On a scale of 1 to 10, I give this video a 7. The Before the Dawn, better known as BTD, music video is set in a field that looks like part of a prison. High walls and a guard tower surround it. The sky is an eerie green, a little lighter than the grass. The boys start off strong with a few catch on’s and some strong arm work. The beginning of the song is actually in English saying, “because I listen to my heart beat one by one.” This is sung in a very heavy Korean accent, but still clearly understandable. Between the leather costumes and the sharp and almost angry dance moves, Infinite looks like they are about to get into a fight. The feel of the music video, the song and the dance is very passionate. They are hitting their moves and singing the lyrics with intent. As Sunggyu, the second solo singer in the song, starts to sing, there is some heavy, gasping breaths in the background. They almost sound desperate to finish this song while still standing. The next English phrase leading up to the chorus is said by Sungjong, “Why, why?” Then the chorus builds up and the boys mix long, flowing arm movements with sharp, centered ones to show the contrast. It is very interesting to see the two different styles put next to each other in that way. The bridge after the second chorus focuses on a rap by one of the main rappers in the group, Hoya. 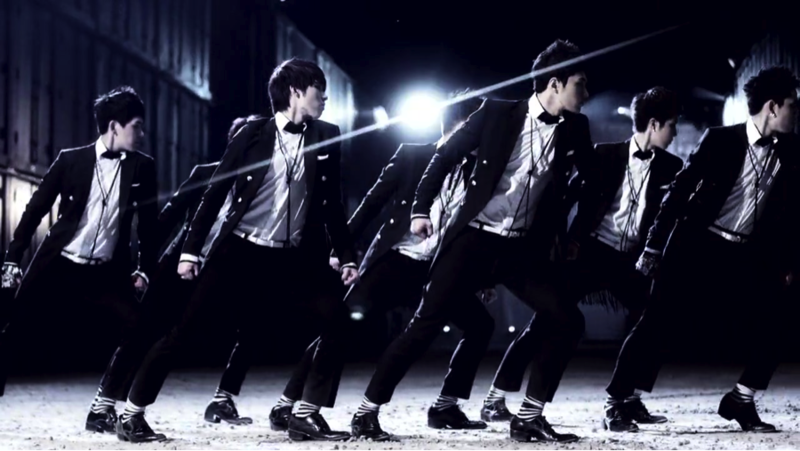 The most exciting part of the music video is the dance move that is done right at the end of Hoya’s rap: “the scorpion dance.” The members all go to the floor in a circle, facing outwards. Then, they all kick their back leg up and smoothly slide up to a standing position. Because of the formation they are in and the music at that point, it gives the feeling of excitement. The audience is left to wonder how exactly the band pulled off such an intricate-looking move while looking so smooth. Then, the modulation ends off the song with some rapping on top of it. The rapping at the end accompanied by the music really gives an eerie, almost unfinished vibe. On a scale of 1 to 10, I give this music video a 9. The final video, and most recent of the three, is called The Chaser. This is perhaps one of the best songs Infinite has ever had. 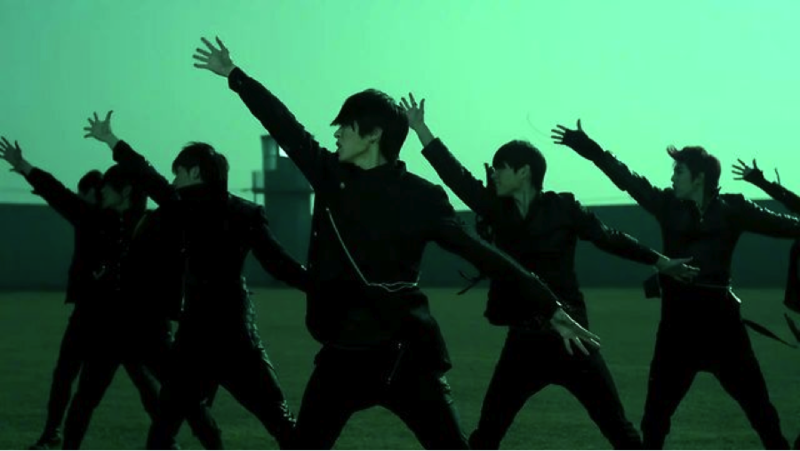 Although the choreography was not the same as their previous dances, there were awesome visual effects made with formations and certain moves that made it one of my favorite Infinite dances. The video starts off with Infinite facing the back. When the music picks up, they all turn around, and then two at a time, they start to dance their way into a V formation. Then, Sungyeol struts his stuff up to the front of the formation wearing a sassy little scarf that bounces as he walks. The first vocalist, Sunggyu, then comes to the front while the rest of the group members do their own individual dance moves that all seem to compliment each other as well as set each of them apart. This effect, to me seems like organized chaos with different members hitting each beat in the music and then milking moves for the rest of the time. The use of diagonals as they do different ripples is an example of how Infinite works together to create amazing visual effects. With the suit-like, patterned outfits and triangular background, Infinite strikes again with their different and interesting image. Then comes my favorite move of the dance, and one of my favorite moves Infinite has ever done, the high five yourself and brush it off move. They do it in such a deliberate way while looking at the camera that it’s almost as if they are daring you to judge them about giving themselves a high five. Then, the second chorus gets dramatic as Infinite forms a circle around their leader, and they all except he, drop to their knees. This is a particularly cool effect, because it amplifies the vocal part while simultaneously keeping the dance on point. Yet another modulation rocks the end of this song, bringing the excitement up to new levels. It becomes so much that you just cannot help but dance and sing along even if you don’t know the words. (From experience, it is super fun to just make up your own words.) The video ends with a slowly panning out shot of the members of Infinite doing the high five move again for the last time. This video as a whole really did a good job of singling out the person who was either singing or rapping at the time. Between the other members dancing around them (even touching them) and the beat, the audience had no trouble finding who was supposed to be in the spotlight at each part. On a scale of 1 to 10, I give this music video a 10.